I’ve been procrastinating all month on the 1st pie of my pie-a-month New Year’s resolution. I knew I was making Lemon Meringue, Adam’s special request. But it wasn’t until I had the idea yesterday to make a matching apron each month to go with the pie that I finally got motivated. 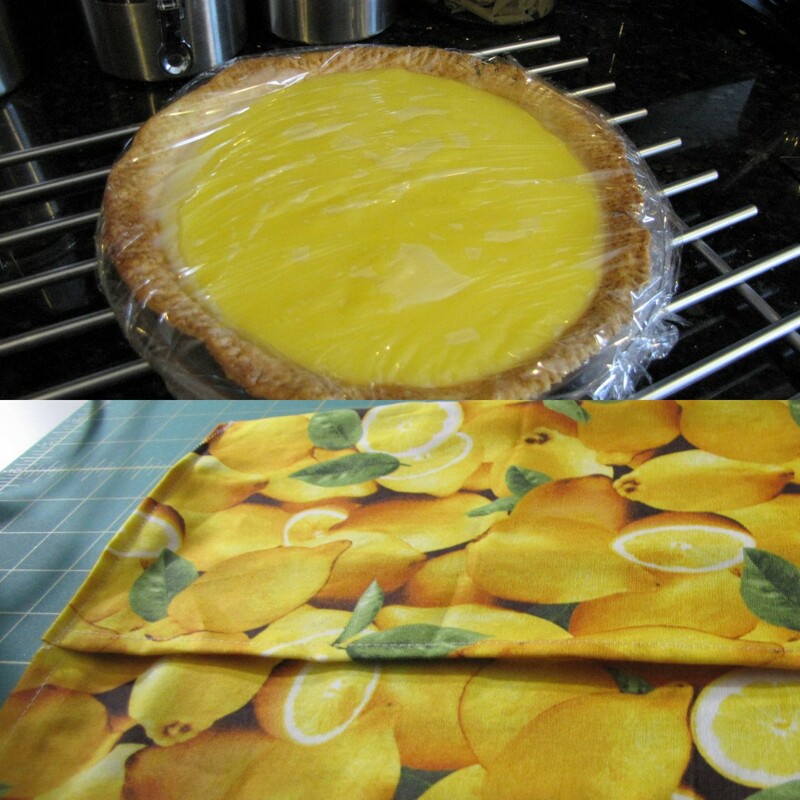 I have decided this is a genius way for me to use up some fabric stash (that’s not even the only lemon fabric I own), get creative with my pie plans, and once and for all feel like Donna Reed. I used Martha’s Pate Brisee recipe for the crust (because it didn’t call for shortening), and America’s Test Kitchen Family Baking Book’s recipe for the filling and meringue. And I used 2 yards of lemon fabric from the Farmer’s Market collection from RJR fabrics, about 8′ of ribbon for the ties, white thread, and a length of yellow bias tape for the neck. I’ve tried to explain how I made the (completely improvised and certainly not by-the-book constructed) apron as we go along with the pie. Enjoy! 1/4 cup ice water, plus more as needed. 2. With the machine running, add ice water through the feed tube in a slow, steady stream, just until dough holds together without being wet or sticky. Do not process more than 30 seconds. Test by squeezing a small amount of the dough together; if it is still too crumbly, add a bit more water, 1 tablespoon at a time. 3. Turn out dough onto a clean work surface. Divide in half, and place each half on a piece of plastic wrap. Shape into flattened disks. 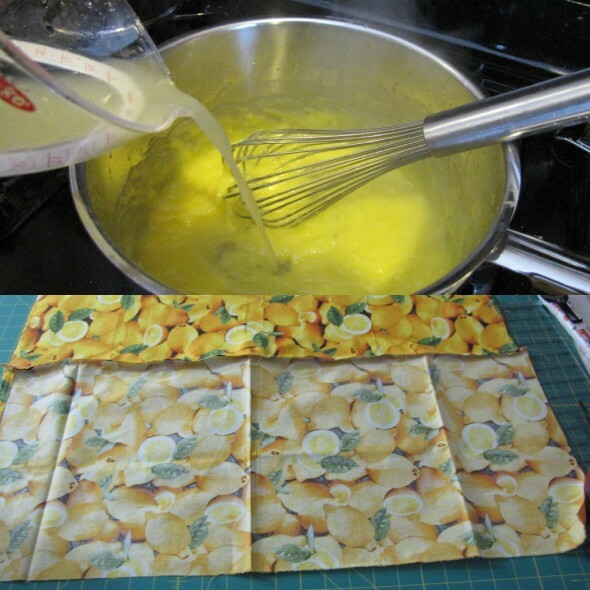 Wrap in plastic, and refrigerate at least 1 hour or overnight. The dough can be frozen up to 1 month; thaw overnight in the refrigerator before using. For the pie: Take one pie dough disk out of the fridge. Flour a work surface to roll out the dough (I actually used crushed graham cracker crumbs instead of flour, a suggestion from America’s Test Kitchen for custard pies). 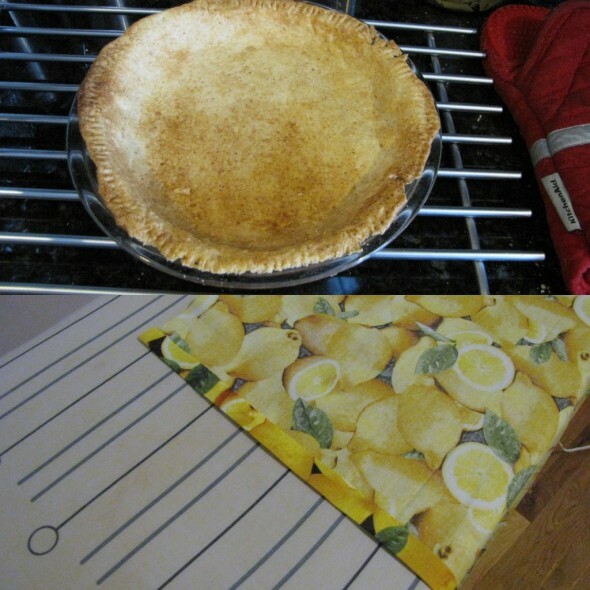 Roll the dough out into a 12″ round, then fit the dough into a pie plate. Trim, fold, and crimp the edges of the dough to fit the plate, then wrap it in plastic wrap and freeze the dough-lined pie plate for 30 minutes. For the apron: I used an apron I already owned and liked to cut a template for the lemon apron. I pinned the old apron to the fabric and cut an extra 1/2″ off of each side for seam allowances. For the pie: Put an oven rack into the middle position and preheat the oven to 375. 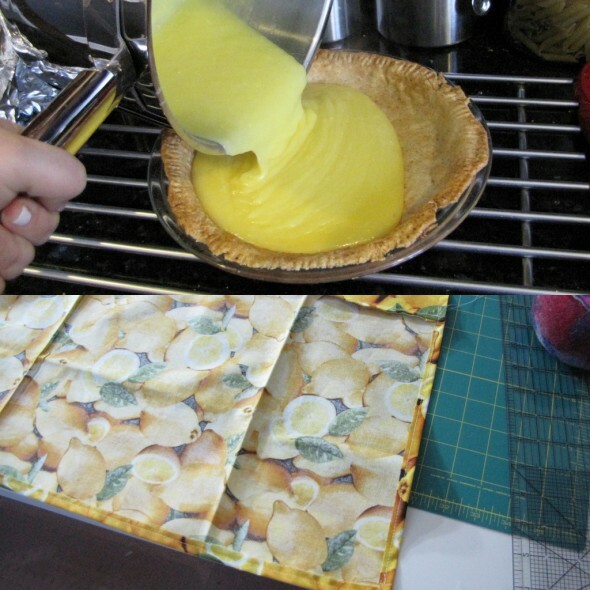 Line the chilled crust (in the pie plate) with 2 layers of foil, then fill with pie weights. For the apron: Cut out the apron shape from the fabric. For the pie: Bake the pie crust until it looks dry and light in color, 25-30 minutes (this is hard to do blind, I had to guess when it was done). Remove the weights from the foil and bake until the crust is deep golden brown, another 10 to 12 minutes. Let the crust cool to room temperature (I left it overnight, wrapped in foil). 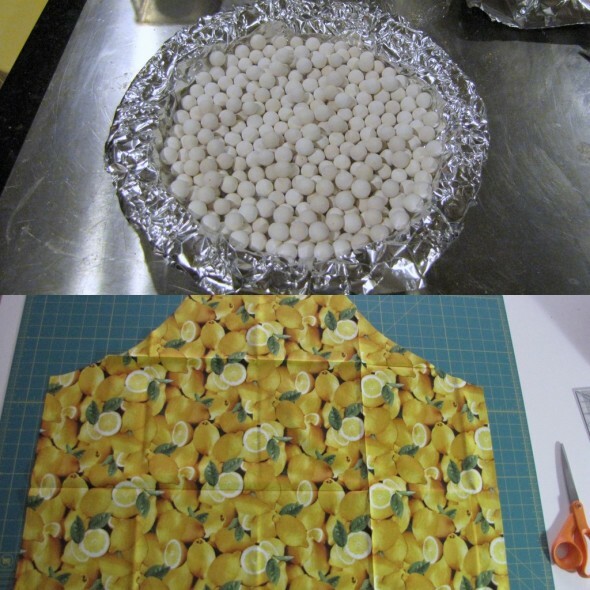 For the apron: Turn the fabric right side down and fold back half an inch of fabric on all sides. Press in place. For the pie filling: Bring the water, sugar, cornstarch, and salt to a simmer in a large saucepan over medium heat, stirring constantly. When it starts to turn translucent, whisk in the egg yolks 2 at a time. For the apron: Flip the apron back over right side up and sew a 1/4″ seam all around the edges, securing the back fold. For the pie filling: After all the eggs are mixed in, whisk in the lemon zest, then the lemon juice, then the butter. Bring everything back up briefly to a simmer, then remove the pan from the heat. For the apron: Here I realized I’d cut a ton of fabric off the bottom of this apron while squaring it up, and it was too short. If you don’t make this mistake, you can skip ahead to the straps. If you want to stay, this is when I improvised pockets for the bottom to fix the mistake. Cut another strip of fabric, wider than your apron and about 12″ long. Sew the edge to the bottom seam of the apron, using a 1/4″ seam allowance, so the wrong side of this panel faces up. For the pie filling: Pour the filling into the baked and cooled pie crust. For the apron: Fold the edges of the extended panel back about 1/2″ an inch, as we did for the original apron panel, press and stitch in place with a 1/4″ seam allowance all the way around. For the pie: Lay a sheet of plastic wrap directly on the surface of the lemon custard and chill the pie until the filling is cold, about 2 hours. 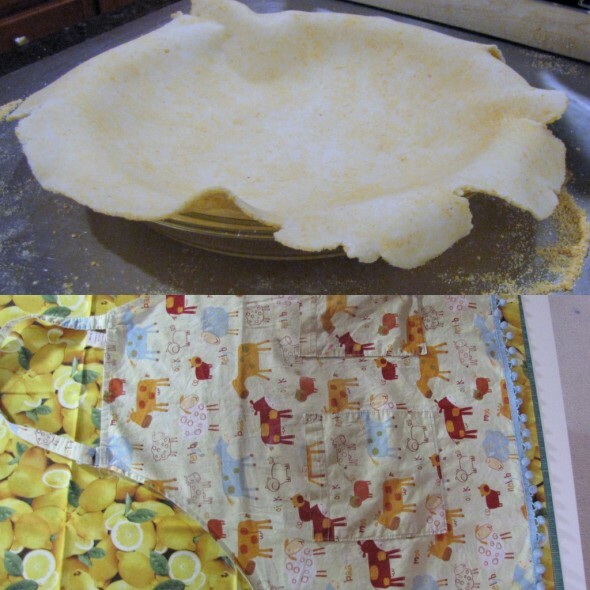 For the apron: Fold the panel up and pin in place so 8″ of the extension show on the bottom. This is your pocket. Stitch it closed around the 2 sides and the bottom, leaving the top open. Okay, now for some steps without pictures! For the meringue: Preheat the oven to 400 degrees F. Bring the sugar and water to a boil over medium-high heat and cook until the mixture is slightly thickened and syrupy (about 235 degrees F on a candy thermometer), 3 to 4 minutes. For the apron: Attach the lengths of ribbon to each side of the apron, zigzag stitching them in place at the corner where the slope of the apron meets the bottom side. For the meringue: In a stand mixer (or large bowl with electric hand mixer), whip the egg whites, cream of tartar, and salt together with an electric mixer on medium-low speed until foamy, about 1 minute. 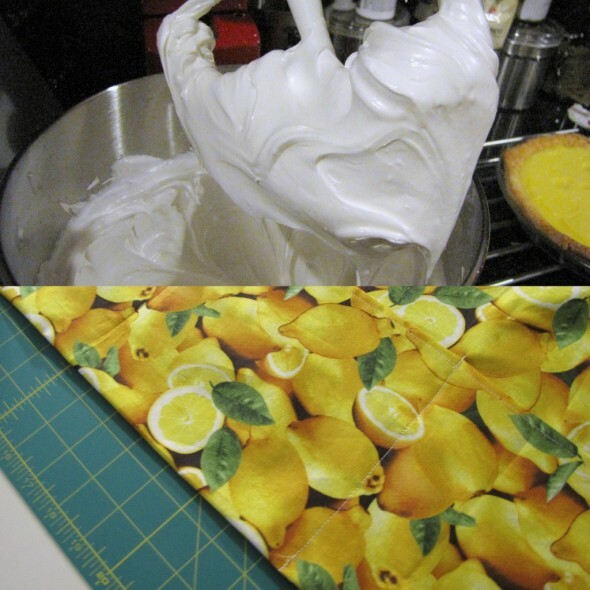 Increase the mixer speed to medium-high and whip the whites until shiny and soft peaks form, 1 to 3 minutes. For the apron: Measure your neck and cut an appropriate length of bias tape. Sew the bias tape closed on the open end using a straight stitch. For the meringue: Reduce the mixer speed to medium and slowly add the hot syrup, avoiding the whisk and sides of the bowl (it makes the sugar harden on the sides instead of incorporating into the meringue). I actually stopped the mixer completely, took out the paddle, and poured the syrup directly into the middle. Then I quickly reassembled and started back up. Add the vanilla, increase the speed to medium-high, and continue to whip the mixture until it has cooled slightly and is very thick and shiny, 3-6 minutes. 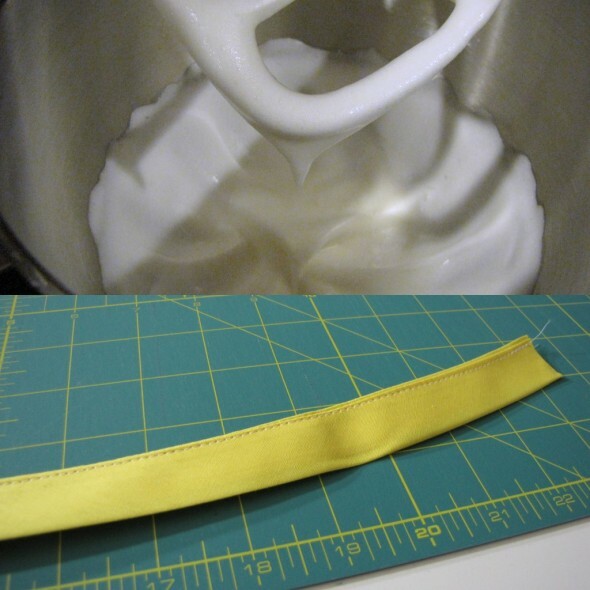 For the apron: Attach the neck strap to the apron. I like to sew a straight stitch in a little box design all the way around each side of the strap, but you could also zigzag it on (no picture for this step!). Create some pockets by sewing a straight stitch up the length of the apron extension in 3 different spots. 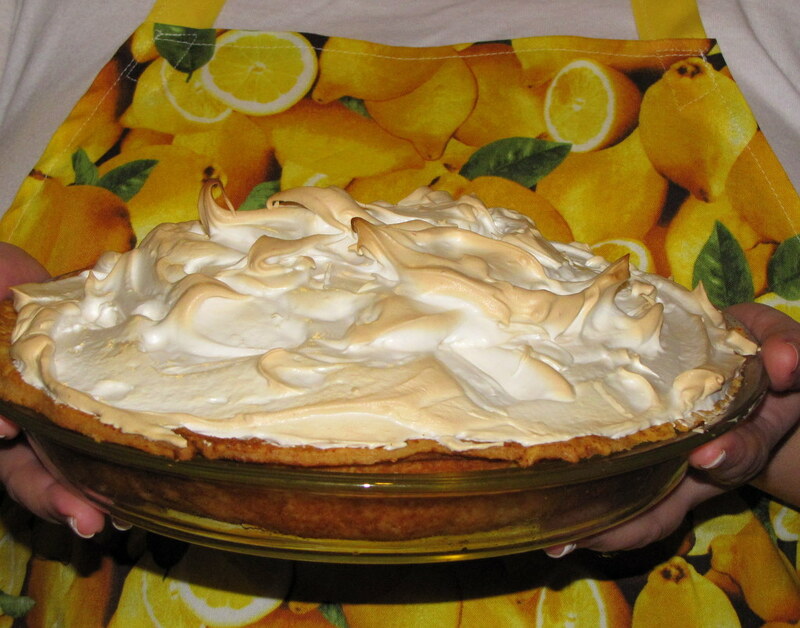 For the pie: Dollop the meringue evenly over the top of the chilled lemon filling and spread it into a neat mound, making sure it sticks to the crust. This is a sticky and surprisingly time consuming step, nothing like frosting a cake. 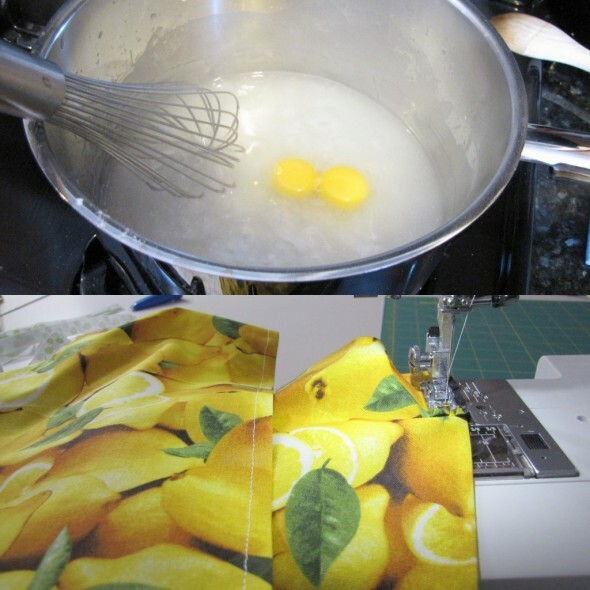 For the apron: Your apron is now finished! Model it in the mirror and take pictures of yourself. 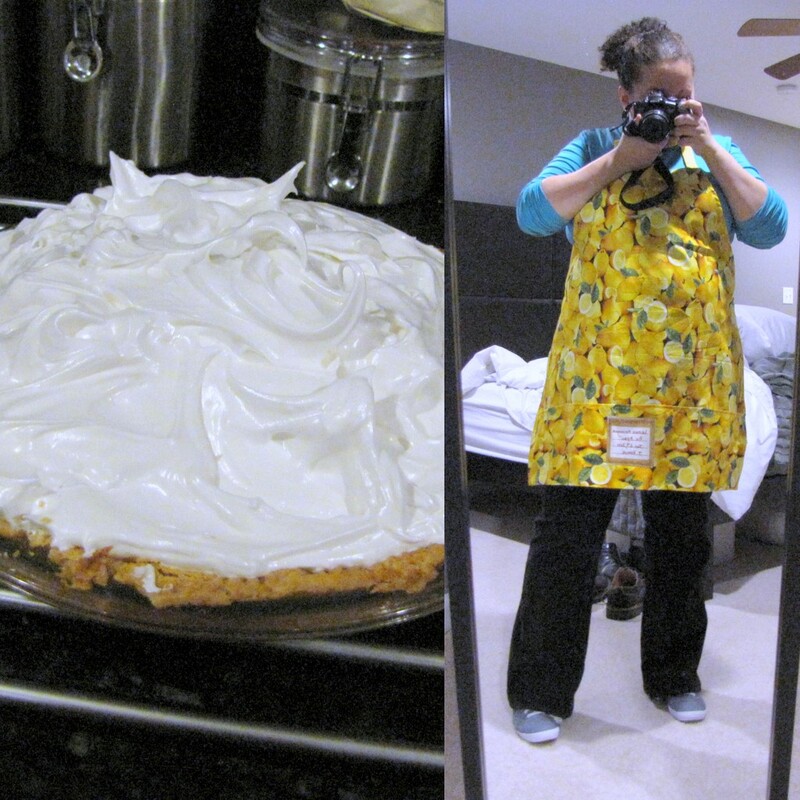 (You can also add a label if you’d like, like I did, to commemorate this pie…or not). 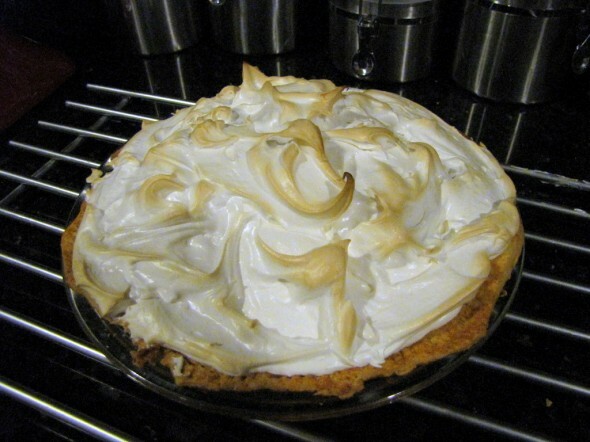 For the pie: Bake the pie until the meringue is golden brown, about 6 minutes. Let the pie cool on a wire rack until the filling has set, about 2 hours. Serve at room temperature.